In this quick, supercozy gluten free, dairy free crumble recipe, tangy cranberries, maple-roasted pears, and a crumbly hazelnut topping infused with the warmth of cinnamon and nutmeg are perfectly partnered with dairy-free vanilla ice cream. 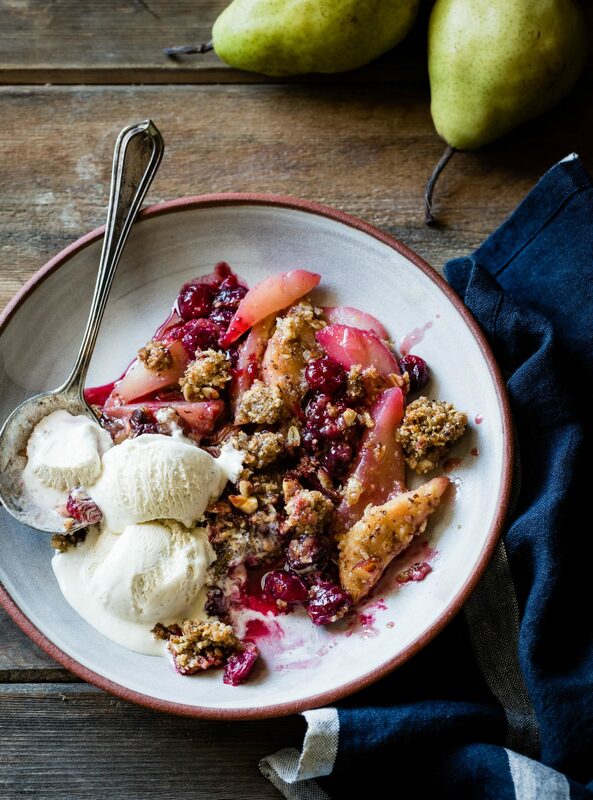 This crumble is best the day it’s made, but leftovers keep, refrigerated airtight, for 3 days and make a great breakfast with a scoop of yogurt. If you prefer dairy butter, use an equal amount of cold unsalted butter and increase the salt in the crumble to 1/2 teaspoon. Make the filling: Position a rack in the lower third of the oven and preheat to 350ºF. Peel, halve, and core the pears and cut into 1/2-inch-thick wedges. Place them in a large bowl with the cranberries, maple syrup, lemon juice, and cornstarch and toss to combine. Scrape the fruit into a 10-inch round or 9-inch square baking pan and bake until the fruit bubbles, about 30 minutes. Give the fruit a gentle stir to redistribute. Make the crumble: In the bowl of a stand mixer or in a large bowl, combine the hazelnut flour, oats, tapioca flour, brown sugar, cinnamon, nutmeg, and salt. Add the cold vegan butter and beat on low with the paddle attachment or rub with your fingertips until the butter is worked in and the mixture forms large, moist clumps, taking care not to overmix. Stir in the hazelnuts. Chill until needed. Evenly crumble the topping over the baked fruit, keeping some pieces in hazelnut-size chunks. Bake until the fruit is bubbling vigorously and the topping is a deep golden brown, 25 to 35 minutes. Let cool slightly. Serve warm with ice cream.